PlusUrbia’s best work is born of a healthy, intense collaboration with the public and private sector. Our work with the Wynwood Business Improvement District was a perfect combination of collaboration with private and public sector visionaries on the BID, with the City of Miami and from the Akerman law firm’s land use practice. The resulting Wynwood Neighborhood Revitalization District (NRD) envisioned a vibrant and eclectic person-first district that is walkable, innovative and filled with mixed-use development, 24-hour activity and a healthy balance of land uses. We were proud when our innovative approach to shared parking, micro units, transfer of development rights and preservation of legacy buildings and businesses was honored with the American Planning Association’s Gold Economic Development Award. The national APA award is the highest honor in the urban design profession. But we are even more gratified of our winning collaboration on the NRD, thanks to the BID’s recently-released Market Report. The report, created by Integra Realty Resource, basically proves that our work has resulted in virtually unmatched economic activity – in a district that was a mix of warehouses and light industry not that long ago. The best news in the report is that our goal — to create a live/work/play neighborhood to balance the artistic, restaurant and retail uses – has come true in just a few years. 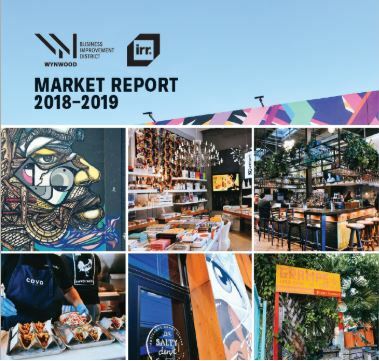 The report shares dozens of facts that demonstrate that Wynwood already is one of the most valuable neighborhoods in Miami. And the district has a healthy mix of chip projects, all properly-scaled within the BID boundaries thanks to our regulations, in the pipeline for years to come.